Ken Kearney: Kearney Goes to the Dogs! Stubby...he was the family dog all through my Watsonville High School days. He was a pure-breed English Cocker Spaniel. He liked to eat the fruit from our pippin and bellflower apple trees. He would keep my feet warm at night as I slept outside our cabin under the stars. I could hear the Barn Owls screeching and the crickets chirping. Stubby made me feel safe from the night. note: I made my special Donald Duck sound as I snapped this photo with my Kodak Brownie camera. Here I am with my pal Stubby. We lived in Aptos, CA... my two brothers my dad and I. We called a small cabin home. It was on an acre of land with redwood trees and several dozen apple trees. My dad had a plant nursery there...Fuchsias and African violets. "Pop" had 100 varieties of Fuchsias! Us kids were good at transplanting and pruning! The violets had to be kept warm and were housed in a building that is still there to this day. This was near Redwood Village on Soquel Drive. We would take a school bus to Watsonville High School every day. Kearney and Stubby a few years later. Stubby was quite the ocean swimmer! He could go through those waves and keep up with the best of us! After all he did have web-feet! He loved to roll in the warm sand to dry off after a swim. At home all you had to say was "you wan'na go to the beach"? He would run for the car and you couldn't get him out of there till we got to the beach. Stubby gets dressed up! You can see part of the cabin in the background. This was one of my nephews dogs. It shows the flow of action using a panning technique! 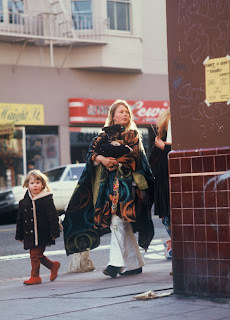 A Haight-Ashbury hippie dog...circa:1969 San Francisco, CA. 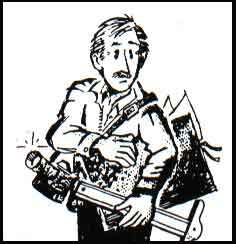 Cartoon drawing of a hopeful hitch-hiker, 1969 San Francisco. Pooch glamour shot. I often had requests to do photos of pets at my Aptos Studio.